I can proudly say, the day before Thanksgiving our fireplace is DONE! It is getting harder to work around my active, needy kids, but if I can do it, anyone can. and.... drum roll Please...... dum dum da da!!! We haven't put the TV back yet, part of me doesn't even want to. I am not a fan of Tv's on top of mantels (it is like worshipping the tv... nerdy! ), but that is where it is all wired so it will eventually be there again. I have to say the mantel completely changes our whole family and kitchen area. It is just STUNNING! (confession: I have been sitting, staring at it for the past couple days with a big FAT smile on my face). Oh my God, Mikael, it's lovely! Totally worth the sacrifices. And how perfect it is to be ready for Thanksgiving? Congratulations! Such a fantastic job! You should be very proud. It really looks great! It looks so pretty Mikael! I can see why you've been admiring it. :-) Great job and excellent price! What about some doors to hide the TV? Seems like you've got the know how to put them up. Stunning!! I love fireplaces, and its always a shame when they're not really used as a focal point in the room. Yours turned out gorgeous! That is fantastic!!! Good job!! love it...great job and what a great price! would you share where you got your sideboard table...i a looking for one. This is absolutely gorgeous!! I just found your blog today from the SITS site. I'll be checking back often to see what else you're doing. I'm not bad at decorating, but I'm not gifted like you seem to be. I'm excited to see what all I can learn from you. Great job. That is just stunning. I'd be sitting and smiling too! Great job and I love your break down ! Love it! Wow, the molding really makes it pop!!! Beautiful remodel. What a difference! Great job. I love it! Wow! Your mantel is fantastic and I am very impressed with the pricetag too! I have a corner fireplace too and I really dislike it. 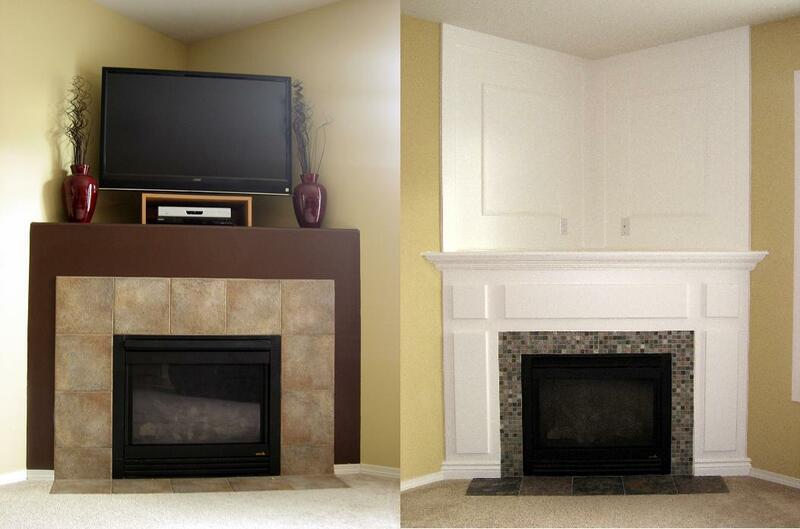 I had seen a redo on another site that is similar to yours and was just telling my daughter today what I'd like to do to the fireplace one day. I'm so glad to see your lovely makeover, I am so gonna do this to mine! The transformation is wonderful. Love the white. I have to confess that white is definately my color of choice this year. If you get a chance I would love for you to stop by as well. Wow...that is GORGEOUS!!! You did a great job! This turned out Beautiful!! I love all the molding and mosaic tile you used! We too are in a middle of a remodel and have just redone our mantel. Love it! Wow, I love it! What a transformation! You are talented! Wonderful job.. love all the beautiful molding. Have you thought about having doors made to cover the tv? That way when you aren't watching the tv, it could be hidden away behind doors that make your mantle look like all one piece. 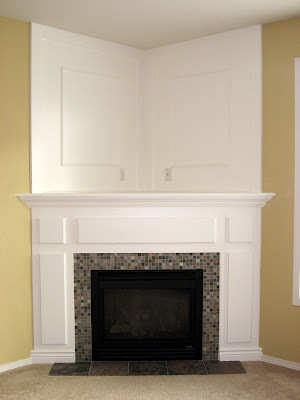 I don' think I would ever watn to put doors on my fireplace, it is much too pretty. And I don't mind the tv now that it is up. It all fits in quite well in my family room, and is a bit of a comfort when the kids go to bed :) But I am looking into having some cool art displayed on my tv, now wouldnt that be cool? It looks fab-u-lus!!! I saw this on Before and After blog. Great job. I don't know if I would want to put the TV back there also! So pretty, where did you get your accent tile around the fireplace. We have been looking for months for the perfect colors and those look perfect! Visiting from Better After... it's gorgeous! Beautiful! We had a similar corner fireplace (but it had two different sized alcoves, one above the other) when we moved in. It was so ugly! I like having a mantle, but a gas fireplace is not cheap to run, and not real neccessary in my warm climate. Plus, my bookcases wouldn't fit if I left it in, and I didn't want everything to face the corner, so . . .
my husband ripped it out! And it looks so much better! We have a window there now instead! Your husbant is a Saint, too many nuturals in kitchen. The white over the mantel is overkill. Balance, shelves on wall compared to top of fireplace, its always about balance. Lots of hard work, good efforts. Please take the vases off the mantle, t.v. is enough. Can place large one on floors on either sides of fireplace. Steps would look better without rug. link: http://www.blogger.com/comment.g?blogID=833162953174185050&postID=979609821611009607 is being flagged as a potentially malicious web site in my internet browser opera. You can lose a lot of website visitors due to this problem. This is a topic that іѕ close to my heart. .. Cheers! Exаctly wherе are your contact details though? Doh! I was domain name searching at namecheap. so I decided I'd come check it out. Wonderful blog! My site has a lot of exclusive content I've either written myself or outsourced but it seems a lot of it is popping it up all over the internet without my permission. Do you know any methods to help prevent content from being ripped off? I'd certainly appreciate it. blog to take most recent updates, therefore where can i do it please help. add to the discussion. It is a result of the sincerness communicated in the post I browsed. to drop a commenta response :-) I actually do have some questions for you if you do not mind. have to post. Could you list all of your community sites like your linkedin profile, Facebook page or twitter feed? Thanks for finally writing about > "Fireplace: The Reveal" < Loved it! information you provide. It's nice to come across a blog every once in a while that isn't the same outdated rehashed information. Any way I'll be subscribing for your augment and even I success you get entry to consistently fast. but I'm having a hard time selecting between BlogEngine/Wordpress/B2evolution and Drupal. The reason I ask is because your layout seems different then most blogs and I'm looking for something completely unique. lol. So let me reword this.... Thаnk YOU for the meаl!! I'm trying to achieve the same results and wanted to know what you set your saw to in order to get the angled cut look? user of inteгnet thus from now I am using net for content, tɦanks to web. Got somethin to say or ask.. I hope it is nice ;) Love to hear from you! I seriously have no time to do this blog. But hey, why not. I like to over extend myself to the point where I have to lock myself in the bathroom with nothing but chocolate and a hot bath. We all have our issues.